The Hindu Nai people fact two reasons to be discriminated against in Bangladesh. They are Hindus, which puts them at odds with the Muslim majority. To make matters worse for them, they are from a low Hindu caste. Cutting hair or doing anything else which involves bodily functions is considered work for those of low status. This low status applies to them no matter which South Asian country they reside. Some try to make up for it by taking on surnames associated with Brahmins. The Nai can find work anywhere in Bangladesh where people need haircuts. The Nai are noted for being talkative and good with conversation. Depending on where they work, they might be poor or middle class. Those who work on urban streets do not earn as much as those who work in more prestigious shopping centers. They also perform other services like cleaning ears and helping with sprains. Some Nai people have stopped being barbers. Most of these take care of livestock or work as carpenters and the like. A few have access to higher education and the opportunities that provides them. As Hindus, the Nai people suffer from a great deal of fear of the gods and spirits. They believe that evil spirits cause them harm, so they must be appeased. They have reverence for Shiva, one of the main Hindu deities, and Sen Ghagat, a saint from their own community. Many Nai worship a regional deity as well. The Hindu Nai people in Bangladesh need the opportunity for their children to have an adequate education so they can advance beyond their lowly state. * Pray that the Nai people in Bangladesh will find their peace in Jesus and be freed mentally from being second-class citizens due to their caste ranking. * Pray that the Holy Spirit will call many Nai people to Himself, and use them to gossip the gospel to many others in Bangladesh. 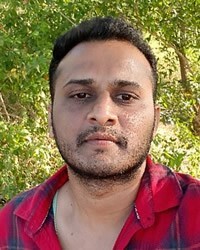 * Pray for a disciple making movement among the Nai people in Bangladesh and India. 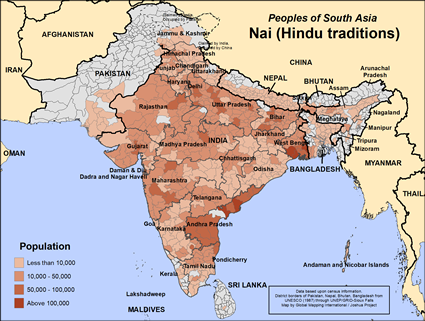 https://en.wikipedia.org/wiki/Nai_(caste)View Nai (Hindu traditions) in all countries.